The first 3 months for $1. From the 4th month $14.97 for 3 months. More flexible. More efficient. Professional results. SOUND FORGE Audio Studio combines a familiar 'feel-good' audio-editing experience with top quality results. Whatever your audio needs – be they recording, restoration, editing or mastering – it delivers an efficient, speedy and versatile solution. SOUND FORGE Audio Studio offers flexible and dynamic editing with the new Event Tool. It’s now possible to make cuts to your audio files without hard transitions which you can adjust, edit and undo at any time, long after they were made. Use the Event tool to edit audio events like cuts and their crossfades so removing any pops, clicks and other noise. With the new Event Tool you can edit audio files virtually and non-destructively. Edit audio material in real time and then save your projects. You can then open them later, edit them further or completely undo all of your changes. It's very easy to cut your audio audio material into individual events to work on. You can edit each one, adding high-class effects or using precision editing features, or simply move the cut passages on the timeline and regroup them. Create crossfades between individual audio events, and with complete precision for smooth transitions between files. You can then also easily edit these crossfades to remove extraneous pops, clicks or other noise. SOUND FORGE Audio Studio comes with a completely customizable interface so it now looks the way you want it to look. The GUI is adjustable over four different hue levels: Dark, Medium, Light and White. The window layout is also flexible and can be altered according to your needs and workflow so you can work better, smarter and more efficiently. You now get a flexible and customizable interface with SOUND FORGE Audio Studio 13. From bright to dark, set the user interface to the hue you want to work with. Choose from the following colours and shades: White, Light, Medium or Dark. Thanks to newly-designed icons, many of the main software functions are now much easier to identify. You now know instantly where to click to start recording, edit audio files or save projects, so your workflow is vastly improved. The arrangement of windows for various functions is now completely tailored to your needs. Whether it's audio editing, recording or mastering, there are individual presets with custom layouts to give you immediate access to all the features you need. Forget the old days of audio editing with just two channels. SOUND FORGE Audio Studio 13 delivers up to six channels of audio and the flexibility of full 5.1 surround sound. Now you can edit surround audio files with up to six channels. 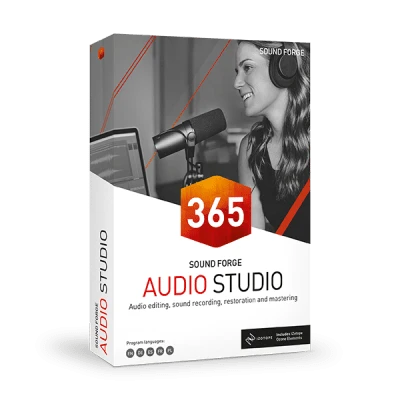 SOUND FORGE Audio Studio can, for example, automatically split 5.1 files into multiple channels which you can then edit individually or together to create a full surround experience. 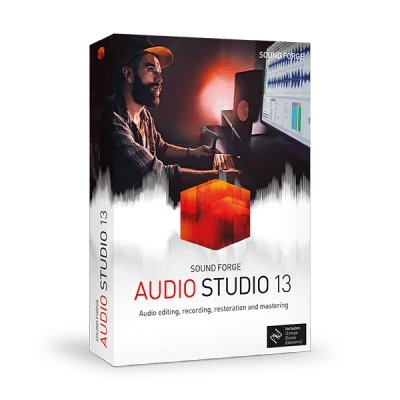 In SOUND FORGE Audio Studio 13 you have total flexibility to work with and between different types of audio files. For example, you can work with both mono and stereo audio files and also easily convert one format to the other. Load mono or stereo files into SOUND FORGE Audio Studio and use the remaining free channels to create different audio set-ups. You could, for example, have multiple podcast speakers spread across a single room each playing a different channel. "I have tried several audio editors in the past, but I always return to SOUND FORGE Audio Studio because it's the easiest to use and completely fulfills all my requirements for recording voice over auditions and narrations." "I have been using SOUND FORGE Audio Studio 12 for few days and I'm truly enjoying it. It didn't take me long to learn how it works as it's very intuitive. And, I love the Edit Audio for Video option! This options now makes my YouTube videos' audio sound so much better, since I can edit and correct them in SOUND FORGE Audio Studio 12. My current video editor has very limited audio editing options and SOUND FORGE Audio Studio 12 is now a lifesaver. Thanks again." "SOUND FORGE Audio Studio 12 is a super powerful audio editing and restoration tool. I love the visualization view that lets me see actual meters to represent the frequencies in the audio for quick eq decisions. Also, the audio restoration tools are some of the most effective and intuitive tools I've ever come across. The DeNoiser works great for cleaning up imperfect audio and removing background noise from vocal recordings in my videos. This has definitely become a staple in my overall editing process."